In the wake of a disappointing season f or Marist’s football team, there is still one light that shines bright. 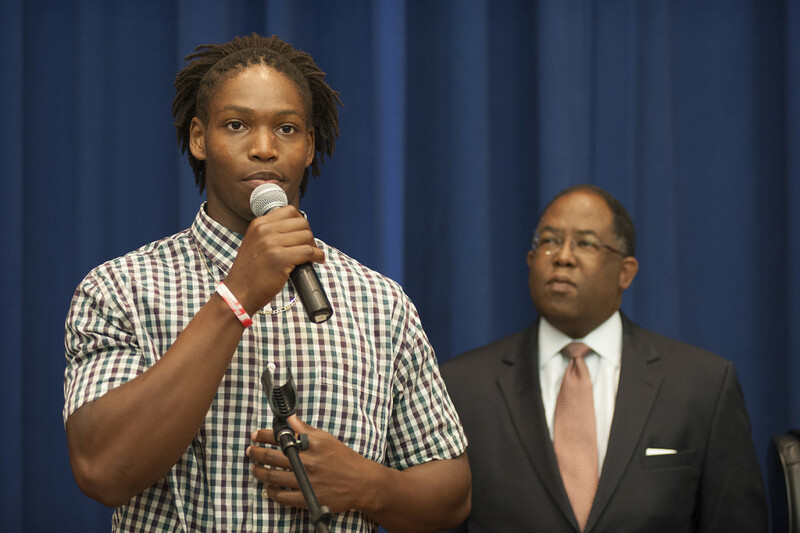 Caylin Moore surpassed the odds of growing up with family and domestic problems in Los Angeles, CA to become a recipient of the Fulbright Award Scholarship and do something that no other Marist undergraduate student has ever done. His past may be dark and scary, but his future is bright. Moore has beaten the odds of getting off the tough streets of Los Angeles, and going to a prestigious college. With a football scholarship, he majors in business with a degree in economics. At first glance, everything might seem smooth and joyful for Moore on the outside, but what his past holds is anything but that. People who don’t know what he has been through might think he’s your typical student athlete, but the obstacles he’s had to face will change anyone’s perspective on him completely. “Caylin has been through a lot and he is a soldier,” Jim Parady, coach of the Marist football team said. Parady said how he really researched Moore and recruited him for being a great athlete, and most importantly, a good human being. When he was in fourth grade, Moore’s mother was sexually assaulted after having heart surgery. She fell into a clinical depression afterward. “She was bed ridden for a span of like two or three months,” he said when explaining the story. “I pulled her off the couch and sat her down in the bathtub. I then told her to wash her hair which I thought could help her. That little encouragement that she needed went a long way.” After this happened, Mrs. Moore started feeling better and knew she needed to get back on her feet for her kids’ sake. This work ethic and mind frame he upholds was the driving force behind him being considered a recipient of the Fulbright Summer Institute Scholarship. Moore is the first ever Marist undergraduate to receive this prestigious opportunity. This program sponsors U.S. and foreign participants for exchanges in all areas of work. This includes sciences, business, public service, government, and the arts. The U.S Department of States funds the Fulbright program and supports student exchanges with 155 countries around the world. Since his freshman year at Marist College, Moore has maintained a 3.7 GPA or higher each semester. On top of his exemplary grades, he has been in works with doing community service once a week all around the Hudson Valley Region. Marist assistant football coach, Jake Dembow, said, “Caylin is one of few guys on our team that volunteer to do community service. Once a week we will go out in the community, either to elderly homes, orphanages, or homeless shelters to give back to the society that supports us.” Moore even has time to play a pivotal role in Marist’s campus ministry. A big influence on Moore was what happened outside of the classroom. As a kid who has never traveled outside of California before college, he got to experience a society outside of his norm. He lived at Stoke Bishops Hall at The University of Bristol with British students, accents and all. He met a member of British Parliament named Stephen Williams. 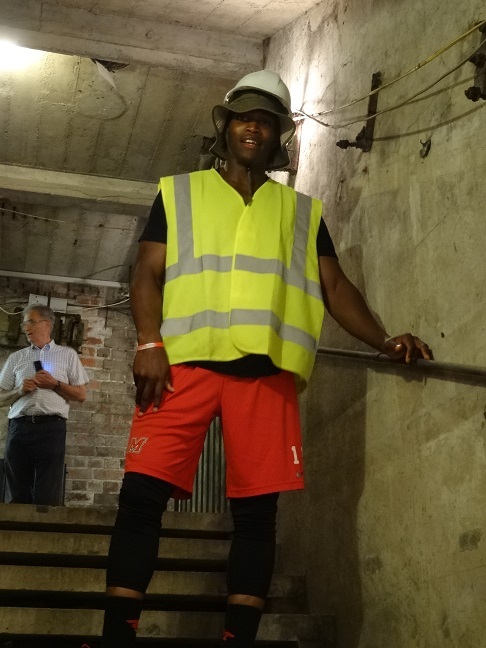 He went on an archaeological dig at the Berkely Castle, and visited the Roman Bath’s in the City of Bath, England. He even gave a thesis presentation on systematic oppression and continuity after slavery and emancipation.